Ah, the joyous Holiday Season begins � a time for rampant illness (cue flu season), unsportsmanlike behavior* (never step foot in malls and big box stores), and increased levels of non-work-related injuries and illnesses (decorating and getting the house ready for guests). I�ve come to one iron-clad conclusion about the whole holiday thing: the Christmas trees are getting revenge. It could be because the trees are fed up with only being associated with this winter holiday hoopla, or because they resent having to die and be used as decoration, or because they don�t want to spend their last living weeks laden with lights and tinsel and heavy ornaments. I�ll give the disclaimer that I don�t decorate for the holidays anymore, except for a smallish wooden wreath placed somewhere in the front room and three stockings, one for me, one for the Exceptional Spouse, and one for the dog. I will admit that having a 100+ pound Alaskan Malamute with a penchant for gnawing on ornaments was the original reason we stopped decorating. So, why are the Christmas trees trying to get revenge? Let�s start with the tree itself � do you purchase a real live tree, or an artificial one? Here�s the pros and cons of each related to safety and indoor air quality. Regardless, the cons seem to outweigh the pros in either case. Solution? Maybe move past this �essential� aspect of the holiday season and choose not to buy a tree, live or otherwise. For a pretty interesting history of Christmas trees, see this video and article from The History Channel. Let�s move on to the process of putting up your Christmas tree. In the case of real live trees, you either go to a lot and find one that suits you, or go chop one down yourself. Then you find a way to plop it into or on top of your car, drive it home, and wrangle it into the chosen room. The same issue arises when you�re wrangling the tree through your front door or garage and into whichever room you designated. You�re getting a nice face full of needles, pollen, mold, and whatever else is on that tree while shaking and dragging the tree into position. The particles are released into the room and will be there long past the time you recycle your tree. So, now you have the tree in the designated room. You�re likely going to take the somewhat heavy tree and put it into a tree torture device tree stand, where there is just enough water to keep it alive (provided you remember to refill it) and large screws are applied to the trunk to keep it upright. However, these tree stands are usually made of cheap plastic or metal and may not be hardy enough for the tree you�ve selected. The tree may not be secure in its base and fall over. The stands usually state something like �for 10-foot trees, ideal for 6-inch trunk� rather than indicating the weight limit the stand can effectively support. Keeping your tree well-watered during the holidays is important for fire safety and aesthetics. NFPA has a dramatic video showing the difference in fire spread between a dry tree and a well-watered tree. An alternate version of the NFPA video has other safety ideas for holiday decorating. Your tree is up, installed in its stand, and is ready to be decorated. The anthropomorphized tree is chuckling to itself (when it isn�t wincing from the liberally applied steel screws at its base) as it watches you try to set up your too-short ladder to place the hideous tree-topper your son made 24 years ago. The chuckles turn to nervous laughter as you wrap the tree in cheap strands of lights � it wonders if you understand that heat + electrical malfunctions + combustible material = fire. The nervous laughter turns to a whimper when you load it down with heavy ornaments and garlands. 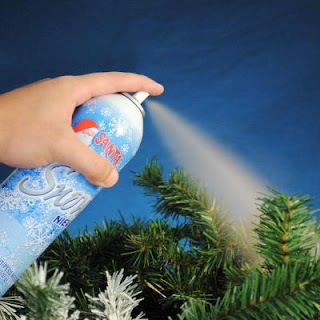 The whimper turns to despair as you spray the tips of its boughs with artificial snow from an aerosol can. NFPA also has some safety-related information associated with Christmas trees and holiday lights. The strands of lights you install on the tree should be UL-listed and inspected prior to installation, checking for burnt out or broken bulbs, nicks in the electrical insulation, and other potential issues. Remember that older strands of lights frequently have lead coatings and are made of PVC. The ornaments you select may have heavy dust (you meant to clean them last year but became too busy), and may also contain irritating or dangerous metals (lead and nickel) and chemicals, either in the paints or in the ornament itself. Garlands and tinsel are also frequently made with PVC and are excellent collectors of dust and other potential allergens. On to the artificial snow, which usually comes in an aerosol can. There is a silicone-based artificial snow spray that looks pretty intriguing, and it has a less-scary list of chemicals in its Safety Data Sheet. A common type of artificial snow spray is this: �Santa� brand snow. Not a chemist? Butane is the liquid inside your lighter (vapor catches fire easily) and propane is used as fuel in stoves, heaters, and barbecues (vapor also catches fire easily). If you�re thinking that perhaps you�ll just try an artificial tree instead, just remember that the trees are currently not recyclable, they are made of PVC (and so are many of the items decorating your tree), and can catch on fire just like real live trees. The artificial trees with built-in lights are also potentially dangerous since it is difficult to inspect the tree and lights for electrical safety before putting the tree up. Underwriters Laboratories has a �Christmas Tree Safety� video if you�re still bound and determined to do the holiday tree thing. The Industrious Hygienist has done a risk assessment and determined the inherent risks of Christmas trees outweigh the short-lived benefits. More holiday-themed safety posts and the traditional Industrious Hygienist Holiday Manga coming soon!